Ahhh, the luxury of waking up a bit later. we were covering the town fiesta and maybe, mother nature heard the townspeople’s collective prayers – it was a sunny morning. What a time to miss out on Kayangan. So after lunch, the team decided to go back to kayangan.B ut guess what? The weather turned foul again. Oh well, it’s the habagat season. Only Norman and I decided to hike up the vantage point again since the low tide means the banca will have to stay away from the shore. good thing I have my drybag always in my camera bag. Having passed by the white sand Banol Beach, we ended up at Pinnacle Point near sunset time. It’s the season when the sea urchins are really aplenty and in the gathering darkness, it was increasingly difficult to wade safely. Good thing I always have my headlamp with me, again in the camera bag. Dave D. said succinctly, for all the camera gears we have, they’re useless in the darkness. 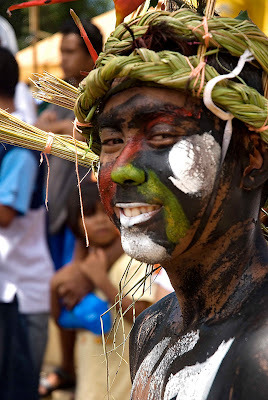 Coming back to the town proper, the fiesta is still in full swing, with videoke singing that reverberates across the nearby rock formations, an all-night disco at the town hall, drinking and perya. Seair and Sony-Ericsson hosted a farewell dinner for us that night (a relief since my cash was running low). Almost called it a night but decided to explore the pantalan and Lambingan Bridge/boardwalk for some night shooting. Also bumped into team leader Norman at Lambingan (after all, he’s the night shooter in the group).S aying rin kasi if I just sleep this night away – the final evening of our trip. True enough, I walked away with some keepers.